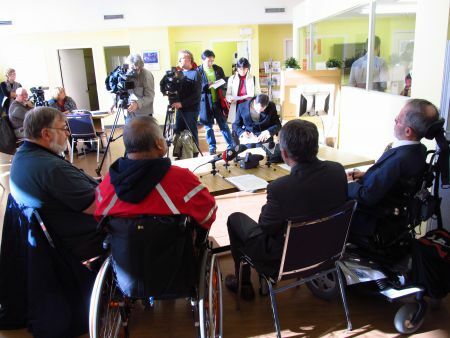 A new report shows that HandyDART trip denials in Metro Vancouver increased by 670% in only five years. Data obtained through a freedom of information request shows that people with disabilities and seniors were denied service 4,900 times in 2008, 13,400 times in 2010 and 37,700 times in 2012. HandyDART is TransLink’s custom transit service for people with disabilities who cannot use the regular transit system for at least some trips. The report shows that TransLink budgeted for 613,000 hours of HandyDART service in 2011, but due to the transit funding crisis this has been cut back to 598,000 hours – a reduction of 15,000 hours. TransLink’s Base Plan shows HandyDART service hours frozen at this reduced level until 2023. The provincial government has delayed transit improvements pending a transit funding referendum to be held by November 2014. In addition, 10,000 hours have been cut from HandyDART and the budget re-allocated to a taxi pilot project. At the end of 2013 TransLink will decide whether or not to continue reducing HandyDART service in favor of using more taxis. The ad-hoc HandyDART Riders Committee and ATU 1724 are co-organizing a public forum on HandyDART Saturday November 23rd 12:30 to 2:30 at the Dogwood Pavilion Seniors Centre, 624 Poirier Street, Coquitlam.